Abbie and Carrie were over tonight and we made this tilapia dish again; the rice is totally the star of the show. It’s mixed with oranges, black beans, tomatoes, cilantro, onions… totally delicious. The last time we made this was for an International Potluck — not only did I not have time to properly photograph the dish, but we didn’t post recipes then, so I figured it deserved a second run. I forgot how good this was. No problem (weirdo)… besides, that’s more cilantro for us! This is so good — I love it! Hey… leave some for Thad! For the tilapia marinade, combine lime juice, 1 tablespoon olive oil, 2 tablespoons cilantro, 1 teaspoon garlic, 1/2 teaspoon salt, and sugar in a shallow dish. Add tilapia and marinate 15 minutes, turning once. To prepare the bean and rice mixture, cook the rice according to package directions and keep warm while the tilapia is marinating. Preheat oven to 400 degrees. In a large, high-sided skillet or saucepan, heat 2 tablespoons olive oil on medium heat. Add remaining garlic and onions; sauté until translucent, about 5 minutes, stirring. Add 2 tablespoons cilantro, oranges, tomatoes, beans, oregano, 1 teaspoon salt, pepper, and cayenne. Cook, uncovered, until hot, 7 to 8 minutes, stirring occasionally. Transfer hot rice to a 9 by 13 inch or 2-1/2 to 3 quart baking dish. Spoon the bean mixture on top of rice and gently blend. Slightly overlap tilapia fillets on top and scrape marinade over fillets. Bake until the flesh of the tilapia just begins to flake at the nudge of a fork, 16 to 20 minutes. This entry was posted on Tuesday, June 24th, 2008 at 12:04 am	and is filed under Main Dishes. You can follow any responses to this entry through the RSS 2.0 feed. You can leave a response, or trackback from your own site. 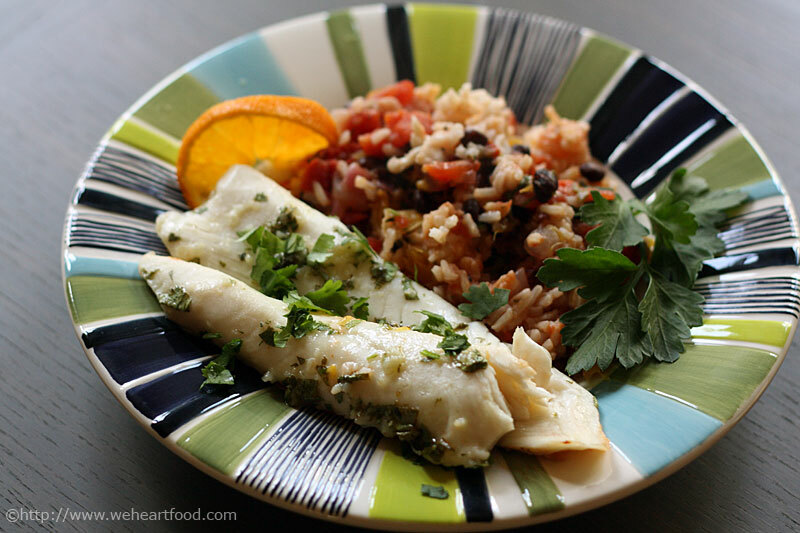 Tilapia is a huge favorite in our house and I’m always looking for new ways to prepare it. Love the flavor profile of this dish! Ann — I’d love some other recipe ideas for tilapia. I think this may be the only way I’ve prepared it at home!